No one knows for sure how it came to be called a coney dog. The most logical explanation is that Greek immigrants passing through Ellis Island in New York heard about or visited Coney Island (where hot dogs were booming) and adopted the name for their own cheap eats. Where did the coney begin? 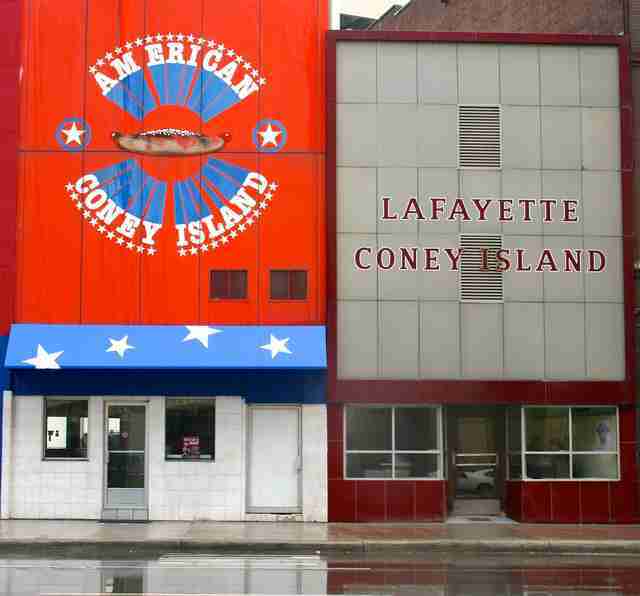 Some say the Lafayette-American scene and some say Todoroff’s Original Coney Island in Jackson. But Todoroff’s doesn’t exist anymore, so now most will agree, that the patron saints of the coney are Constantine “Gust” and William “Bill” Keros, who opened American in 1917, and Lafayette several years later, respectively. Their hot dogs come from the same supplier, Dearborn Sausage Company. Their buns come from the same place, Metropolitan Baking Company in Hamtramck. The key differences lie in the chili and the onions. American’s chili comes from the Detroit Chili Company. Lafayette uses a Keros family recipe “mixed in with a little chili from National Chili Company” according to the book Coney Detroit. Also, American uses sweet Vidalia onions and Lafayette uses Spanish onions. Indeed, Bill and Gust Keros seemed to have butted heads in the 1930s, which gave rise to Lafayette, but Bill Keros sold Lafayette to some of his longstanding employees over 20 years ago. Now it’s sort of a friendly, neighbor-based rivalry (depending on who you talk to). Either way, it makes for great publicity. Obvious, right? Well yeah, when you consider the Motor City was booming and people needed quick, cheap lunches. A meaty, filling snack under $1 fit the bill. In theory, this explains why Michigan is the coney capital; however, it fails to explain why working-class citizens in other cities failed to embrace it. 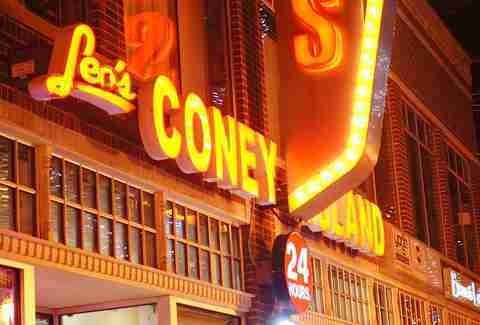 A coney dog from National Coney Island contains approximately 490 calories. Comparatively, a Big Mac contains 563. See? Healthy! That’s why you should always order two. This guy isn’t just some nameless caricature. 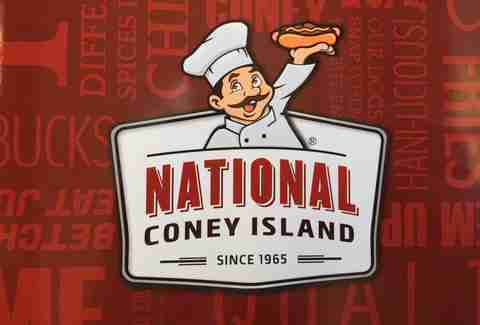 The chef in the National Coney Island logo is officially named Mr. Pop, as in, Mr. Papadopoulos. His name is Leo Stassinopoulos. He and his brother Pete (both nephews of William and Gust Keros) own the chain, and Pete was cool naming it Leo’s because he thought it sounded better. 9. Kerby's is a play on the words "Keros brothers"
Because the owners are brothers and also descendants of the Keros family. GET IT???? 1. 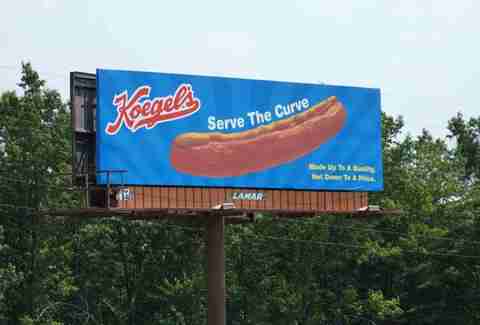 Koegel Meats 2. Abbott’s Meat. The vast majority of coney makers in Flint get their dogs and their chili from these two companies. 11. 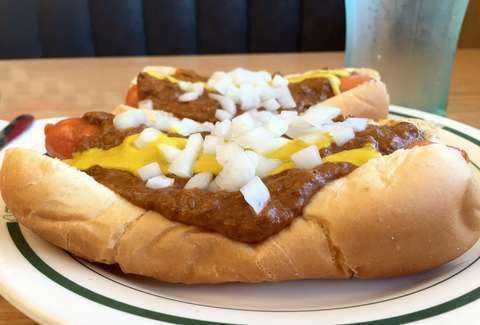 In some places, they even call coney dogs "Michigans"
Yes, you can find coneys beyond Michigan in places as far away as California, Florida, and even that dreamlike state to the south, Ohio, but don’t expect them to be the ones you know and love.